We’re kicking off the first in a series of blog posts taking an in-depth look at some of the new cmdlets that were made available with the PowerCLI 6.5.1 release. This first post is going to be covering the cmdlets targeted at managing DRS groups and their associated rules. We have been given a lab environment and our end result is to have the even numbered App VMs run on the even numbered hosts whenever possible, and likewise with the odd numbered VMs and hosts. We’ll start by taking a look at the DRS Cluster Group cmdlets. These are used in order to create, manage, and remove VM and host based DRS groups. These cluster groups are then referenced by the DRS VM-Host affinity rules, which we’ll discuss in a bit. We now have the required host DRS groups, so we can move forward and create the VM DRS groups. These are created with the same ‘New-DrsClusterGroup’ cmdlet, except we’ll now use the VM parameter and specify the VMs for each group. If you’ll notice, that’s nowhere close to all of the necessary odd numbered VMs. We’ll now make use of the ‘Set-DrsClusterGroup’ cmdlet to add the remaining VMs (which I’ve already stored into a variable). This cmdlet also requires usage of either the ‘Add’ or ‘Remove’ parameter in order to specify what kind of modification is being requested. Before moving on to creating the VM-Host affinity rules, let’s review the DRS groups we’ve created to this point with the ‘Get-DrsClusterGroup’ cmdlet. This cmdlet also has a couple parameters to help gain additional information. The ‘Type’ parameter can be used to specify whether to return VM groups or host groups. The ‘VM’ and ‘VMHost’ parameters can be used to only return DRS groups belonging to that VM or host. Moving on to the creation of the rules… We’ll be using the ‘New-DrsVMHostRule’ cmdlet along with several parameters. These parameters will be ‘Name’, ‘Cluster’, ‘VMGroup’, ‘VMHostGroup’, and ‘Type’. Most of those should be self-explanatory, but ‘Type’ may not be. Thanks to tab complete, we’ll see that the type options are ‘MustRunOn’, ‘ShouldRunOn’, ‘MustNotRunOn’, and ‘ShouldNotRunOn’ and apply to how the rule is enforced against the cluster. These VM-Host rules can also be modified once they’ve created with the ‘Set-DrsVMHostRule’ cmdlet. This cmdlet has the ability to rename the rule, enable or disable it, and modify either the VMGroup and/or the VMHostGroup. These eight new cmdlets are a terrific addition to the PowerCLI 6.5.1 release. They are also a great compliment to the already existing DRS cmdlets! Start using them today and let us know your feedback! This entry was posted in Cluster and tagged Cluster, DRS, PowerCLI on June 14, 2017 by Kyle Ruddy. In this previous post we talked about one of the great new features introduced in PowerCLI 5.5 R2 for configuring EVC, in this post we will continue to show how we can make configuring and using EVC easier with PowerCLI. While configuring EVC on a cluster you will probably need to perform some compatibility checks. Here’s how you can automate them with a script. This entry was posted in Advanced, Cluster and tagged EVC, PowerCLI, VMware on March 24, 2014 by Alan Renouf. Enhanced vMotion Compatibility (EVC) is a vSphere feature that you can enable on a specific cluster to maximize the vMotion compatibility of hosts within that cluster. EVC will make sure that all hosts in the cluster present the same CPU feature set to their virtual machines, even if the actual CPUs on the hosts differ. An EVC-enabled cluster can contain hosts with CPUs of different generations but only from a single CPU vendor. EVC masks only those processor features that affect vMotion compatibility. Enabling EVC does not prevent a virtual machine from taking advantage of faster processor speeds, increased numbers of CPU cores, or hardware virtualization support that might be available on newer hosts. This entry was posted in Cluster and tagged Cluster, EVC on March 17, 2014 by Alan Renouf. I get a lot of questions about what students should expect when taking the vSphere Automation Course (PowerCLI) and thought it would be good to interview one of our top course instructors. So please meet Mr. Joe Christie. PR: Joe thanks for taking the time to participate in this interview. Can you tell us about your Professional background, how long have you been with VMware? JC: I've been a trainer since 1992-1993 and I've been with VMware since Dec of 2005. PR: Can you tell us about your first experience with PowerCLI, what did you like about ? JC: I gave a presentation and worked in the lab for the PERL Toolkit at VMworld2007. When the Powershell Toolkit first came out I was interested because as a Microsoft trainer, I had some exposure to PowerShell. I was impressed with the language and how quickly people seemed to get up to speed producing useable code. PR: Can you tell us about the vSphere Automation Course you teach (PowerCLI)? What types of students is this course for? JC: Students who are familiar with vSphere as administrators with knowledge equal to our Install, Configure and Manage course and also have some familiarity with simple scripting like vbscript, PERL or even advanced batch file creation. PR: What should students expect to get out of course? JC: An understanding of how PowerCLI works interactively, how to navigate the provided help utilities and the ability take existing scripts or pieces of code and use them with little or no modification in their environment. PR: What materials do you recommend people read before attending this course ? JC: there are a lot of tutorials on PowerShell on the internet but if someone wants to purchase a book then "Powershell in Action" by Bruce Payette is a good place to start learning PowerShell. The second edition was recently released. 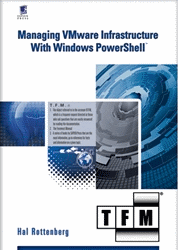 .Students might also consider Hal Rottenbergs book Managing VMware Infrastructure with Windows PowerShell. PR: How will students considering migrating to ESXi benefit from this course ? JC: This course will help users who have built COS based scripts create new scripts for the ESXi environment. As you know PowerCLI and can be an extremely powerful automation tool when used properly. PR: How can students sign up for the course ? JC: They can enroll online have them visit http://vmware.com/go/vsphereautomation. Students should also know that course is available worldwide directly from VMware and through our partners. PR: Can students use their PSO Credits towards this course ? JC: Yes, just like any other VMware Course. Please work with your local representative for more information. PR: Any other words for users out there who are considering using PowerCLI ? JC: Anyone who has done the same task in the vSphere client more than once should take this class. Creating objects, managing objects, retrieving information about objects these can all be automated with PowerCLI and also creating custom Reports which is really easy to do using PowerCLI. Take a look at Yavor Boychev's video. A nice one about Getting Started and about Reporting. This entry was posted in Advanced, Cluster, ESX, Extensions, Guest, Hardware, Logs, Network, Performance, Reporting, Storage, ThirdParty, VMworld, Webinars on October 19, 2010 by Pablo Roesch. Attending VMworld Copenhagen and need to learn more about PowerCLI? If you are attending VMworld Copenhagen and wanted to learn more about PowerCLI this post is for you. If you already know about the PowerCLI please forward this post to your newbie friends. What is vSphere PowerCLI ? vSphere PowerCLI is a set of snapins based on Windows PowerShell that provide administration and automation for VMware vSphere. vSphere PowerCLI ships with over 200 commandlets (pre-built commands) to help administrators manage vSphere. What can you do with vSphere PowerCLI ? vSphere PowerCLI is built on the vSphere API. As a general rule you can do most things with PowerCLI than you can with the vSphere Client. This means that you can script common tasks to help you save time. What sessions should I attend if you are attending VMworld 2010 Copenhagen ? Is there someone that I talk to about PowerCLI and get more information ? This entry was posted in Advanced, Cluster, ESX, Extensions, Guest, Hardware, Logs, Network, Performance, Reporting, Storage, ThirdParty, vCenter, VMworld, Webinars and tagged VMworld 2010 PowerCLI Copenhagen on October 12, 2010 by Pablo Roesch. We invite you to come by our PowerCLI Booth at VMworld Copenhagen and meet our PowerCLI Product Management and PowerCLI Engineering Teams. We also plan on distributing some of our PowerCLI posters as well as other goodies our marketing department has put together. Come with all your PowerCLI questions and feedback ! We look forward to meeting our European PowerCLI fans ! This entry was posted in Advanced, Cluster, ESX, Extensions, Guest, Network, Performance, Reporting, ThirdParty, vCenter, VMworld, Webinars and tagged powercli booth vmworld copenhagen, vmworld tech exchange on October 5, 2010 by Pablo Roesch. Hope to see you at VMworld 2010 Copenhagen. We have a great line up of sessions and activities for our PowerCLI fans. Hope to see you there. Who gave that VM 4 CPU's ? Who connected the NIC to the DMZ PortGroup and when ? In this session, Luc Dekens and Alan Renouf will show you how to automate the answers to these questions with the help of PowerCLI.The solutions presented will show you how the combined strengths of the rich PowerShell command set and the PowerCLI snapin provide you with powerful tools to make this all happen. Alan and Luc will show you how to take PowerCLI beyond the listing and reporting stage. They will show you how to write and use scripts that will inform you when problems actually. This session will show several aspects of working with PowerCLI. The classic PowerCLI approach but also the use of the SDK methods when execution speed is required. And the use of third party products like PowerGUI, PowerWF or Microsoft System Center Operations Manager (SCOM) to integrate the solutions even better into the corporate environment. Luc and Alan will show several practical demos to highlight this integration. One of the demos will show for example how easy it is to use Active Directory to find a user’s email address and send him a message to tell him that his guest is using too many snapshots. If the mail stays unread, the script can try to reach the user via a Tweet. Alan and Luc in SF VMworld – As you can see the sign in the back – register early. These guys tend to draw a massive crowd. Abstract: This lab will provide hands on training for scripting a VMware environment. The goal is to provide all the tools needed to automate, integrate, and extend VMware vCenter™ for your environment. Attendees will use the Microsoft PowerShell based PowerCLI for scripting VMware vCenter™ and ESX. They’ll walk away from the lab with a better understanding of VMware Infrastructure, resources for using the toolkit, and a variety of scripts for performing common administrative tasks. Exercises will cover performing tasks based on VM attributes, performing actions on many VMs at a time, and exporting performance data. This lab does not require programming or scripting experience. We will have our PowerCLI engineering and product management teams during event. So please do come on over and say hello. We will be in the Cloud Infrastructure and Management Solutions. vSphere PowerCLI booth in SF. We will also have plenty of PowerCLI Engineering and Product Management teams to ask questions and give us your feedback. This entry was posted in Advanced, Cluster, ESX, Extensions, Guest, Hardware, Logs, Network, Performance, Reporting, Storage, ThirdParty, vCenter, VMworld, Webinars and tagged powercli vmworld copenhagen - vmworld tech exchange on September 27, 2010 by Pablo Roesch.